For Sale: HP (Lovecraft) Sauce! From Howard’s favourite country in the world (besides America), comes the brown sauce of choice for all sundry fictioneers: HP (Lovecraft) Sauce! So saucy! Also available on white tees, and a mug, and a brown sticker. Now, I don’t pretend that this is brilliantly original, as it’s far too obvious a pun for that, and I’ve already seen a whole bottle cartoon in green with tentacles, but I dare say it’s the result of hard work and TLC. Ideally, this will cause people to do a double-take when they see it. 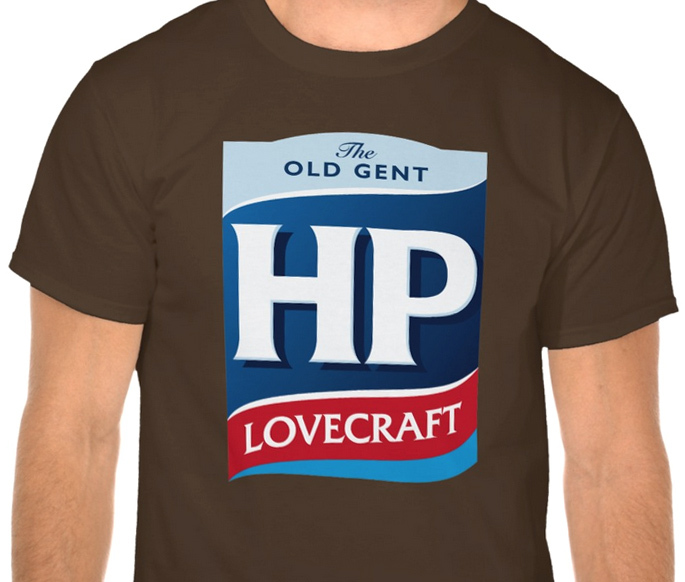 Author Staff WriterPosted on September 28, 2015 April 4, 2017 Categories Design, Physical ObjectTags Advertisement, HP Sauce, HPL, Humor, Lovecraft, sauce, Shirt, Silliness, ZazzleLeave a comment on For Sale: HP (Lovecraft) Sauce!